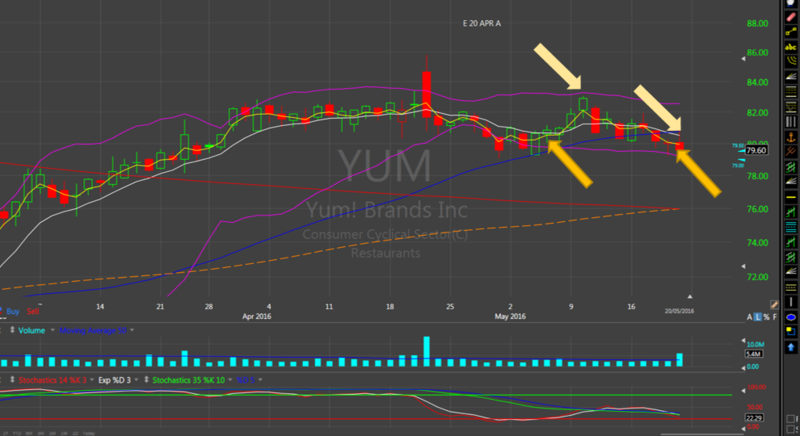 On the 5th of May YUM was at a support therefore we sold a put. We sold puts at strike prices below support and we closed them out for profit early. We closed them coming in to expiration as the stock started to move back towards support. Time value had erroded and we banked good profit. We banked our profit because we saw the stock moving back down towards the support. The stock was support and we sold puts at a strike price below support. We had to wait until we closed out. As the stock moved up strongly we sold additional puts at higher strikes. Once the stock reached a resistance and started to pull back we closed our puts and banked the profit. In that way we could make more money in the same period of time.